After months of news, teaser trailers, and hands-on previews, Gameloft’s latest entry in its first-person shooter series is finally here. As was the case with MC4, there’s a lot to look it with this latest sequel, so this first part of the review focuses primarily on the single player campaign and underlying gameplay mechanics. In that regard, Modern Combat 5: Blackout (Free) is an excellent sequel that makes some dramatic improvements to said mechanics while keeping the actual FPS action mostly unchanged. Visuals have become a huge part of the Modern Combat series and Gameloft raises the bar yet again in this latest sequel. While overall visuals see a nice upgrade in terms of fidelity, Modern Combat 5 seems to put a greater emphasis on supplemental effects such as underwater views, particle/dust filters, explosions, and some nice weather maps. It’s definitely on the short-list of titles to show off to others if you have a current generation device. I was particularly impressed with the framerate, although I’d highly suggest you turn off banner notifications as they would substantially affect the game while they were on screen. 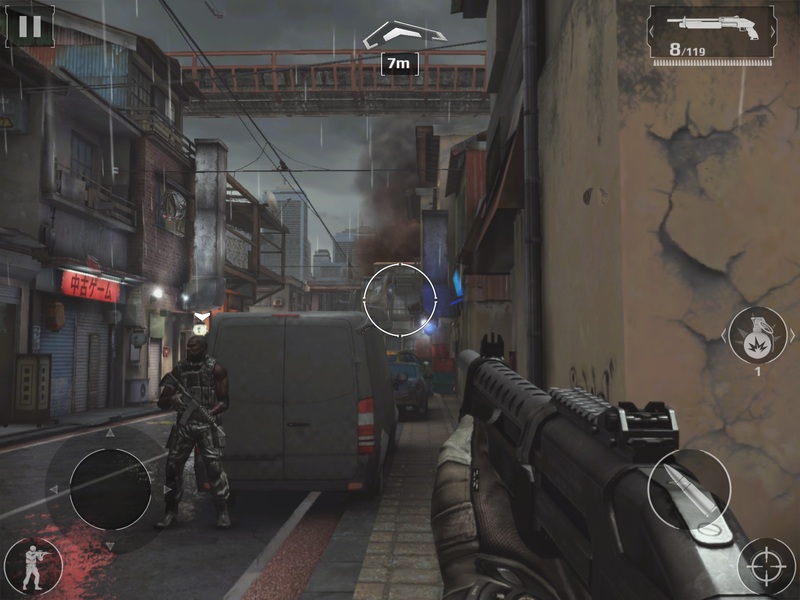 Modern Combat has always placed players in exotic locales, and Blackout continues that trend with missions in Japan and Italy, among other places. A tale that centers around an intense invasion of Japan, combined with covert ops missions, twists and betrayals, I can’t say I’m particularly surprised with the actual meat of Blackout’s story. Then again, I never expected much of the tale and only hoped it would serve as motivation to continue. Thankfully, it hits that mark well enough. 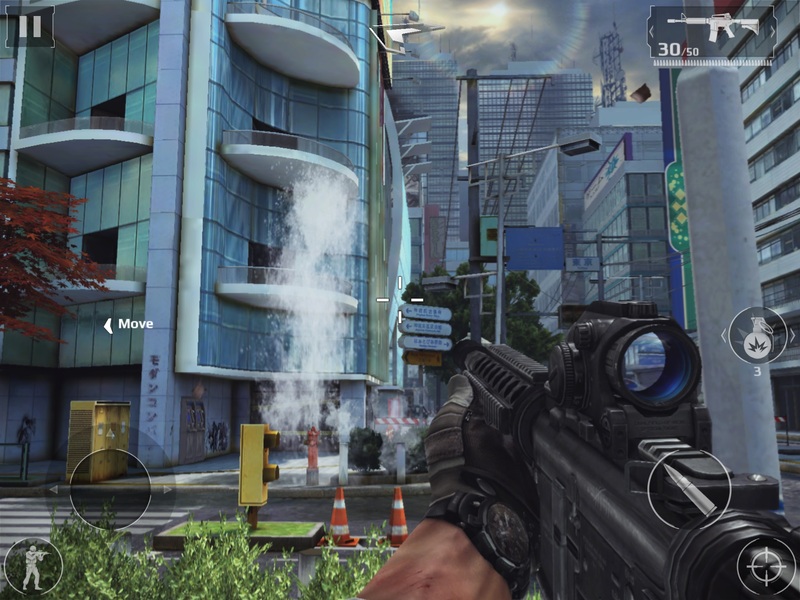 Controls are always an mixed bag with iOS FPS’s and that trend continues with Modern Combat 5. Without built-in MFi support, players are left with the same virtual controls that have become familiar from previous games in the series. There’s lots of aim assists and HUD customization, but virtual controls can only take you so far in an iOS. This is particularly the case when playing on an iPad, as I found the larger screen much harder to control than on an iPhone. Thankfully, controller support should be coming in a future update. In sum, if you were able to handle (or tolerate) MC4’s controls, you’ll do just fine with MC5. 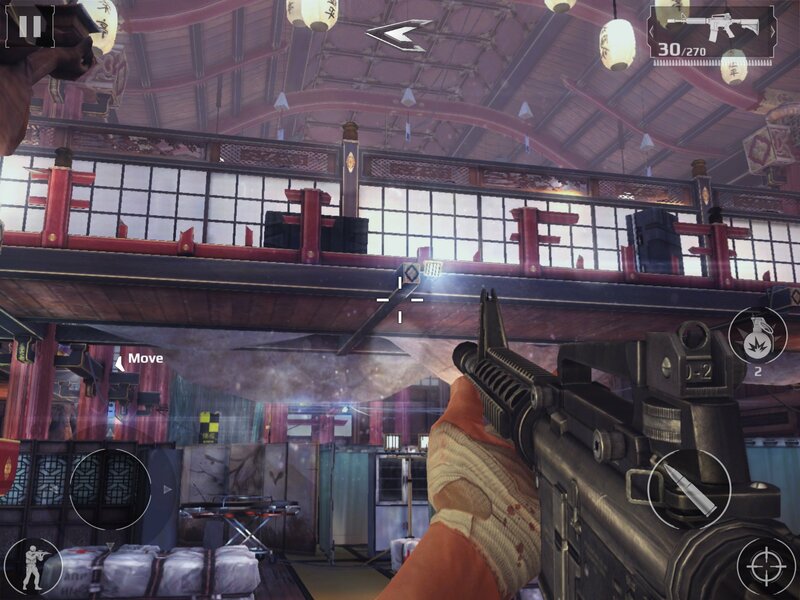 While Modern Combat 5 boasts an in-game FPS experience that will feel instantly familiar, it’s the overarching systems surrounding its single player campaign that gets a substantial upgrade. Missions take place across five different locales, with each offering multiple missions (at least half a dozen or so per location). Missions are divided into ‘Story’ stages (which advance the plot in some form or fashion) and ‘Spec-Ops,’ which are quickie tactical levels that focus dispatching enemies in a variety of ways. Beat all the Story and Spec-Ops missions to advance to the next location. Each location also has multiplayer-specific criteria that can replace Spec-Ops as criteria to advance. Along with the campaign overhaul comes a redesign Modern Combat’s customization system. Instead of a currency system, players earn experience for everything that can be done in a mission. Experience goes towards leveling both an overall rank (which controls class and perk unlocks) as well as a weapon level (which governs weapon-specific unlocks). Multi-kills, headshots, explosive kills – MC5 awards players experience for pretty much everything. Even cooler, the experience and leveling system is persistent across both the single player and multiplayer campaign, which allows players to play in one mode to increase the stats in the other. Overall, I enjoy most of the major changes to the single player campaign in Modern Combat. The shift to multiple, bite-sized missions per locale vice the longer mission structure of the older games feels more in line with the mobile aspect of the game (although the lack of checkpoints within each mission can be an annoyance). While I found the non-story based Spec-Ops missions to be a bit bland, the ability to bypass them with some multiplayer objectives is a welcome feature. Meanwhile, I’m a big fan of the persistent progression system as it provides more meaningful rewards for playing through the campaign instead of having to jump straight into the multiplayer. Part of the persistent upgrade system is a requirement that the game needs to be online at all times. As I’ve mentioned before, the unified upgrade system is a very interesting progression system that I really enjoy but I also realize that it really only works well if a server can constantly keep tabs on stats. An easy way to play your profile on any device is another good plus. However, I did encounter some issues that give some definite cons to the online-only decision. For example, playing on a device without internet access means no single player campaign, period. Spotty internet and/or server status also means that MC5 might actually interrupt and pause your single player campaign if you lose a connection. In a perfect environment it works well but, as my experience with the campaign so far indicates, it’s not perfect all the time. Whether you like it or hate it, the online only requirement has been met with considerable attention. Personally, I think the situations where it becomes an issue aren’t as prevalent as one might think. With that out of the way, there’s really no reason not to check out Blackout. It’s more of the same decent gameplay with a great visual upgrade and a pretty cool overhaul of the class and progression system. Stay tuned as we take the multiplayer out for a spin and report back in a separate review.